BLT. Bacon. Lettuce. Tomato. A simple sandwich that can be made quickly and keep you full for hours. Perfect for lunch or an easy dinner. A BLT sandwich is a pretty easy one to make and doesn’t take very long, either. Yes, it takes a few minutes longer than a regular sandwich with cold cuts, but still only about 10-15 minutes. The hardest part is frying up the bacon. If you know you are going to make a few of these sandwiches throughout the week, you can always batch cook the bacon. Personally, I don’t eat bacon. I know, I know, blasphemy, right? And, I have to say, I’ve never cooked bacon before. This recipe is coming straight from Justin because he makes himself a BLT a couple of times per week for lunch (benefits of working from home!). If he makes one of these on a day that Ryan isn’t at preschool, he is all over the bacon. That boy is a bacon lover, for sure! He asks for it at every meal and always adds it to the grocery list on the Amazon Echo as soon as we get low. The BLT has quite a few good-for-you parts to it. Yes, it’s bacon, and while bacon may not be the best because of all the grease, it still gives you some protein which helps keep you full. Also, it has lettuce and tomato in it, which are both full of nutrients. Plus the bread for your grains. Start by cooking the bacon. Justin likes to fry it in a regular frying pan over medium-high heat until it’s cooked to the crispiness he likes. There are also methods for microwaving and baking bacon, but we haven’t done those personally. Depending on how much bacon you like on the sandwich, you want probably two or three pieces. Justin was cooking four here because Ryan had to have some, too! While the bacon is cooking, spread a bit of mayo on one side each of two slices of bread. Slice a few pieces of the tomato and spread them out on the bread so it covers as much as possible. The amount you need will vary based on the size of the tomato. Top the tomato with a few pieces of lettuce cut to fit on the bread. 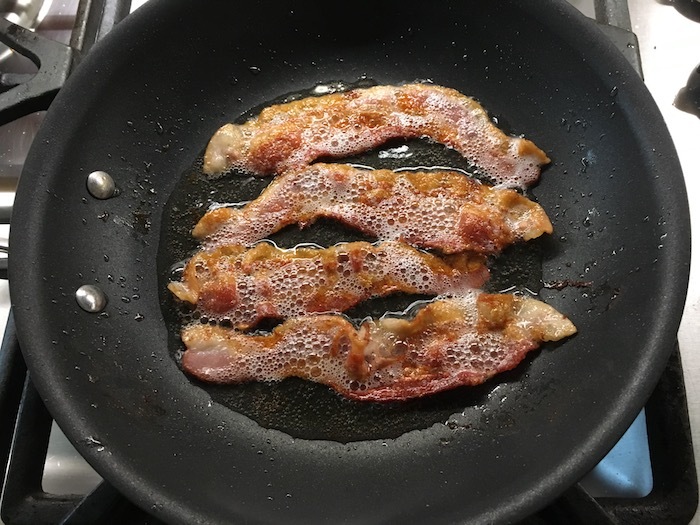 When the bacon is finished cooking, break it into a few pieces and spread that out on top of the lettuce. Close up the sandwich and serve immediately! I’m an absolute sucker for a good BLT but the thought of making one for myself has never crossed my mind. What a simple and easy meal to whip up on a busy day. Yum! This is my husbands favorite sandwich to have! They are so easy and good! I tend to always do my bacon in the oven. Occasionally I’ll enjoy some but I’ve never had it on a sandwich, this is totally something my husband would do to! Ah! You can’t beat a classic! The more simple the more amazing those sandwiches are! I’ll have mine with carrot bacon, thank you very much indeed 😉 yum! A BLT is like the best sandwich ever. This post is making me super hungry! I might have to add this to our menu next week. Love BLT’s and this one looks so yummy. I can’t wait to try this recipe, Thanks for sharing it! You can’t go wrong with a good old BLT! I just love pickles and mayo on mine when I make them!! I always love a great BLT. But the best one I ever did I planted the tomatoes, I made the bread at home, and I baked the bacon in the over as well as making the mayonnaise. It was simply to die for.